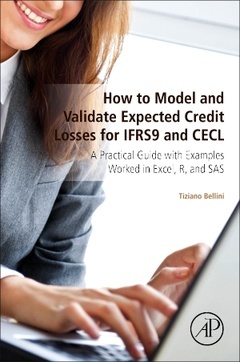 How to Model and Validate Expected Credit Losses for IFRS9 and CECL: A Practical Guide with Examples Worked in Excel, R, and SAS covers a hot topic in risk management. The IFRS9 expected credit loss accounting principle (going live in 2018) and the US CECL standard (going live in 2020) require creditors to adopt a new perspective in assessing their credit exposures. The book explores the best modeling process, including the most common statistical techniques used in estimating expected credit losses. A practical Excel-based approach encourages non-technical professionals to grasp the key concepts required to understand, challenge and validate these models. Additionally, the reader with broader modeling experience will benefit from a more technical dissertation accompanied with cases worked in SAS and R (the software packages most commonly used by credit risk managers to develop their models). Upper-division undergraduates, graduate students, and professionals working in economic modelling and statistics. Tiziano Bellini received his Ph.D. in Statistics from the Università degli Studi di Milano after being visiting Ph.D. student at the London School of Economics. He gained a wide risk management experience across Europe, in London and New York.He currently holds a Senior Management position at EY Financial Advisory Services in London. Previously he worked at HSBC headquarter, Prometeia and for other Italian leading Companies. He is also a guest Lecturer at the London School of Economics. Formerly, he served as Lecturer at the Università degli Studi di Bologna and Università degli Studi di Parma. He has published in European Journal of Operational Research, Computational Statistics and Data Analysis, and other top-reviewed Journals. He has given numerous training courses, seminars and conference presentations on statistics, risk management and quantitative methods.